Award winning rapper Kwesi Arthur has set his eyes on achieving Sarkodie’s level of consistency in the music business. 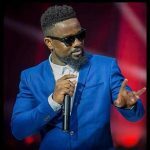 According to the “Grind Day” rapper, he looks up to arguably the greatest rapper in Ghana Sarkodie and will also want to be as consistent as the rapper has been for the past decade. “I look up to Sarkodie, he’s been consistent and that’s something I want to achieve” – Kwesi Arthur said on TV3’s New Day. Kwesi Arthur has been the fan favorite and many music lovers in Ghana sees him as the heir to Sarkodie’s throne.